Moringa oleifera is known as the drumstick tree, and it is a tropical plant that contains edible and nutritious leafy greens, mineral-rich green fruit pods, and pods that feature pulp and edible pea-sized seed-kernels. The drumstick leaves’ nutrition is very unique. As a result, there are many reputable drumstick leaves benefits supported by scientific research. Moringa leaves are particularly popular in parts of Africa and India. The moringa oleifera is a well-recognized member of the Moringaceae tree family, and it may have originated in the sub-Himalayan forests of the Indian subcontinent. It also contains a root that is similar to horseradish; and so, in the western world it is known as the horseradish tree. The plant also goes by other names, such as drumstick tree and ben oil tree. 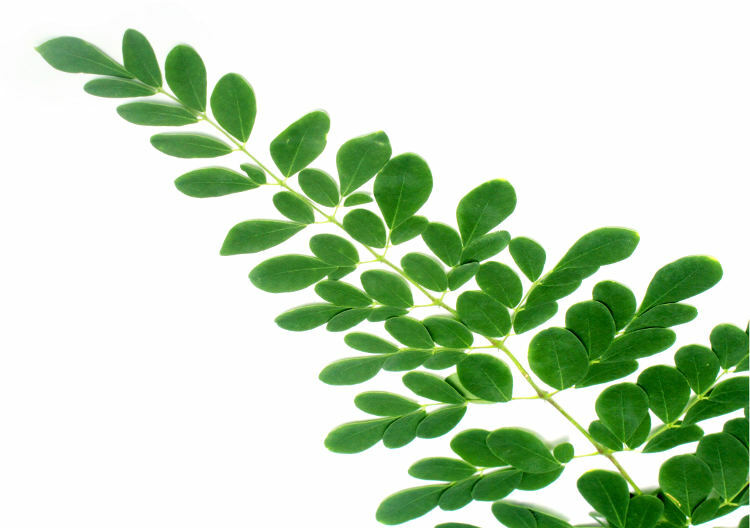 Moringa leaves can be added to the diet to improve overall nutrition, and it comes in either capsule or powder form. Drumstick benefits millions of impoverished communities around that world, including those in need of minerals, vitamins, and protein. It is also important to keep in mind that taking Moringa oleifera in capsule form will not supply a large amount of nutrients when compared to the powder form. The following is a drumstick leaves nutrition chart that contains credible information for a 100 g serving of drumstick leaves. Moringa leaves have many health benefits. For instance, the moringa leaf can boost your immunity, strengthen your bones, treat erectile dysfunction, treat Alzheimer’s disease, decrease liver damage, prevent constipation, relieve menstrual pain, and boost libido. It also has anti-fungal and antibacterial properties that help fight infections. The isothiocyanates may also help treat H. pylori, which is a bacteria implicated in ulcers, gastritis, and gastric cancer. The following are five more main health benefits of moringa leaves. High blood sugar increases the risk of diabetes and heart disease. Moringa leaves have anti-diabetic effects likely due to the compounds in the leaves, including isothiocyanates. Several studies show that moringa leaves may help reduce blood sugar levels. 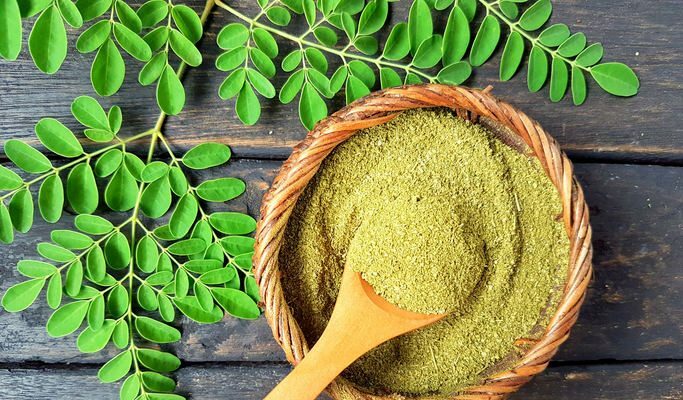 In one study published in the Journal of Food Science and Technology in 2014, researchers found that 7 g daily of moringa leaf powder would reduce fasting blood sugar levels by 13.5% in 30 postmenopausal women (ages 45 to 60) for a three-month period. High blood cholesterol is linked with an increased risk of heart disease. Both human and animal studies have found that moringa leaf may have similar cholesterol-lowering effects as other plant foods. For instance, a 2008 study published in the Journal of Ethnopharmacology found that moringa possesses antioxidant, hypolipidemic, and anti-atherosclerotic properties with the therapeutic potential to prevent high cholesterol, hypertension, and cardiovascular diseases. Another study published in the Journal of Ethnopharmacology in 2000 concluded that moringa leaves had a definite cholesterol-lowering effect in rats. The antioxidants in moringa leaf powder also help the body fight free radicals. In a study published in the journal Food and Chemical Toxicology in 2009, moringa leaf extract had high antioxidant activity, higher inhibition of lipid, protein, and DNA oxidation, and free-radical-scavenging capacity than the moringa seeds and flowers. This means that moringa leaf may prevent the degradation and damage that free radicals cause in the cells of various organs of the body. Moringa leaf decreases inflammation through the suppression of inflammatory enzymes and proteins in the body. Moringa leaf will therefore significantly lower inflammation in the cells. Long-term inflammation is thought to be involved in many chronic diseases, especially cancer and heart disease. Test tube and animal studies have both confirmed the anti-inflammatory properties of moringa leaves, seeds, and pods, which may be due to its isothiocyanates. Arsenic contamination in water and food is considered a major problem throughout the world. Over time, arsenic toxicity may increase the risk of heart disease and cancer. Several rat and mice studies have shown that moringa leaves and seeds may have protective effects against arsenic toxicity, including a 2014 study published in the Asian Pacific Journal of Tropical Biomedicine. Drumstick leaves have been a major part of Indian cuisine for a long time. Moringa leaf is widely used for chutneys and soups. Do you want to know how to cook drumstick leaves? Keep in mind that moringa powder has a distinctive green flavor, so it may be best to start slow when adding it to meals. The following are four simple drumstick leaves recipes. 1-2 cups of unsweetened almond milk or 1 can of coconut milk. Add all dry ingredients together, and cover in almond milk or coconut milk. Let it soak overnight in the refrigerator for a healthy breakfast. Moringa tea is the simplest way to enjoy moringa powder in your diet, and it is great to help add more nutrition to start your morning. 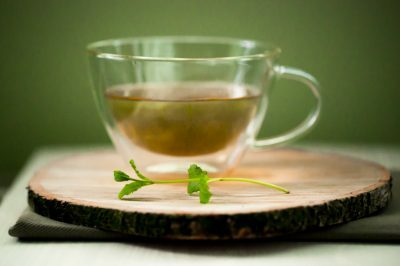 Check out this easy moringa tea recipe below. Bring a cup of water to a boil. Place a teaspoon of organic moringa powder in a glass, and pour over boiling water and add a teaspoon of honey. Stir well and steep covered for five minutes. Moringa leaf powder also makes an excellent addition to your smoothie. The following combination of herbs, seeds, fruit, and other ingredients is great for a perfect healthy breakfast recipe. Combine all ingredients in a high-powered blender. Pour in a large cup and enjoy. Wash the tur dal two to three times in water, and wash and soak the drumstick leaves in a large bowl of water. Swish it around to allow for any dirt to settle at the bottom of the bowl. Take out the leaves, and repeat the process twice to ensure the leaves are clean. In a small three-liter pressure cooker or pan, combine the washed dal, halved tomato, moringa leaves, turmeric powder, and two cups of water. Bring it to a boil, and once boiling, allow the contents of the cooker to cook for 10 to 12 minutes. Meanwhile, in a small pan, heat the ghee and add the asafetida, cumin seeds, mustard, and grated ginger and garlic. Once mustard seeds pop, add the salt, jaggery, coriander powder, and red chili powder. Open the pressure cooker, and mash the dal and moringa leaves with the back of a ladle. Add the heated spices and bring to a simmer. In summary, Moringa oleifera is an Indian tree with lots of health benefits that can help improve nutrition in countries around the world. So far, some studies have shown that moringa leaf may reduce cholesterol and blood sugar. It also has anti-inflammatory antioxidant effects, while it may protect against arsenic toxicity. Overall, moringa leaf is a nutrient-dense plant that can benefit many, especially those lacking essential nutrients such as vitamin A, vitamin C, vitamin B6, vitamin B2, manganese, and calcium. Moringa tree leaves have a flavor similar to radish, and can be used in a salad, blended into smoothies, or steamed like spinach. Moringa powder can also be added to smoothies, soups, stews, curries, and other foods like chia pudding for more nutrition. “Drumstick leaves, raw,” Nutrition Value website; http://www.nutritionvalue.org/Drumstick_leaves,_raw_nutritional_value.html, last accessed Jan. 18, 2017.